Why this history so intrigued Borges I do not know, but I do know that he once collaborated with Argentine composer Astor Piazzola on an album of tangos in 1965. The drawing comes from the University of Notre Dame’s special collections (you can read a Spanish transcription of the rest of the text at their site). The theme of the artwork is a stunning political statement by a writer who has often been deemed apolitical. It is also a remarkably detailed drawing, especially for someone who was losing his eyesight as Borges was at this time. This marvelous depiction supplements Borges’s declaration in his text that Argentineans see themselves as individuals, not as citizens of a specific nation. It is indeed a remarkably detailed work. 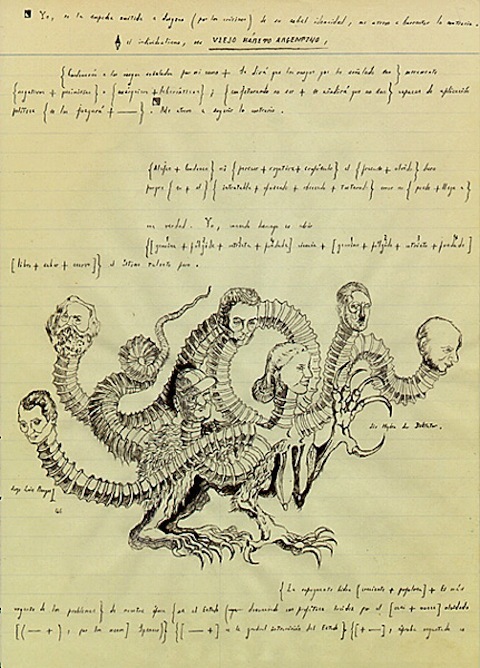 I only wish Borges had supplied illustrations for his Book of Imaginary Beings.